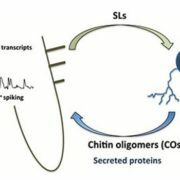 Plants beneath a canopy compete with neighboring plants for light by triggering various physiological responses, collectively known as shade avoidance syndrome. Because of the selective absorption of red (R) light by plants in the upper canopy, plants in the shade are exposed to low R to far-red (FR) light ratios. 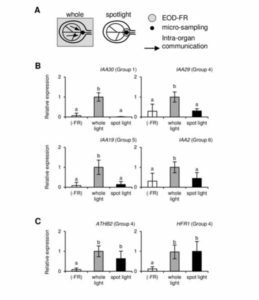 Phytochrome, which absorbs R (660 nm) and FR (730 nm) light, perceives the change in the R:FR ratio that triggers these shade avoidance responses. To determine the spatial organization of this light-detecting system at the organ level, Kim et al. 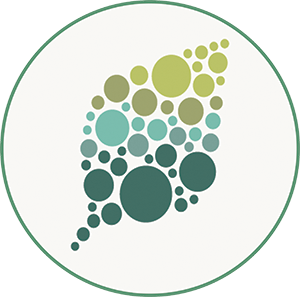 (10.1104/pp.17.01259) have performed transcriptome analyses on micro-tissue samples collected from vascular and non-vascular regions of Arabidopsis cotyledons. 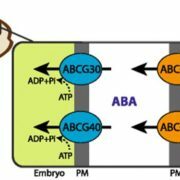 They report that more genes were up-regulated by the shade stimulus in vascular tissues than in mesophyll and epidermal tissues. 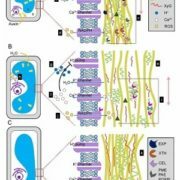 The genes up-regulated in the vasculature were functionally divergent and included many auxin-responsive genes, suggesting that various physiological and developmental processes might be controlled by shade stimulus in the vasculature. 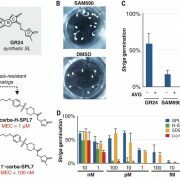 The authors then investigated the spatial regulation of these genes in the vascular tissues. 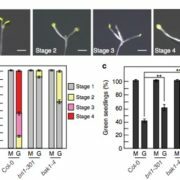 A small vascular region within a cotyledon was spot-irradiated with far-red light, and the response was compared with that when the whole seedling was irradiated with far-red light. 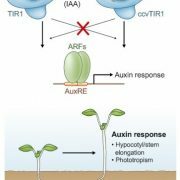 Most of the auxin-responsive genes were not fully induced by the local spot irradiation, suggesting that perception of the shade stimulus requires that a wider area be exposed to far-red light or that a certain position in the mesophyll and epidermis of the cotyledon be irradiated. 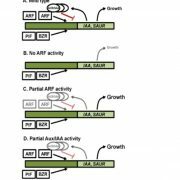 These findings may be related to a previous report that auxin synthesis genes are up-regulated in the periphery of the cotyledon. 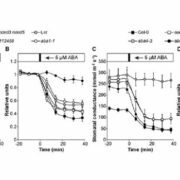 In any case, the data underscores the finding that auxin is an important intra-organ signaling factor controlling the shade response within cotyledons.